Creating a striking mark in the industry, we have earned the name of being a highly reliable supplier of Automatic Stirrup Bender. 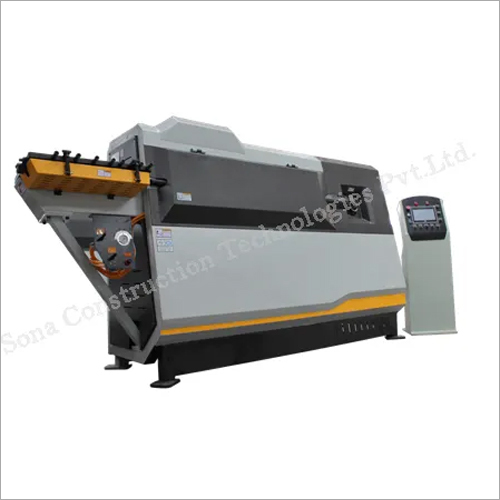 This machine is used for producing stirrups and cutting to size bar using rebar. Adjustable pneumatic operated brake controlled by the machine's control board. The control system of stirrup bender consists of PLC, HMI and feeding & bending servo motor. The machine has a wide stainless steel front panel and the two servomotors on the driving unit. Automatic Stirrup Bender also has stirrup collecting flap, wire inlet unit, anti twist device in the internal straightening unit. 3) Software Introduction : The Entire System software is mainly composed of by the PLC program and HMI program. PLC program structure is divided into data calculation, logical judgements and actions performance. During steel processing, large amount of data calculation task mainly to the completion of the PLC.